A Middlesex University animation lecturer will be showcasing his film at the prestigious London Film Festival on the 17 and 18 October. Robert Bradbrook has created a beautiful and touching film called 'Dead Air'. It combines atmospheric digital animation with live-action performances from actors Jonah Russell and Victoria Bewick. The story revolves around a tranquil island, the bridge that is being built to it, and the fear this development instils in the local island community. In particular, the arrival of DJ Pete on the island shakes things up, as he causes a stir amongst the insular locals with his fresh and irreverent radio show. As Robert explained, the story of the island and the people on it is a metaphor for the story of the UK, and the changes brought about by ongoing immigration. He continued: "When the new bridge threatens the residents' ideas of what their island should be, we discover that communities are always evolving and no one is immune to change. "The underlying message of the film is a hopeful one. Communities have been developing and people have been arriving from faraway places since the year dot! In essence - it's not something to worry about." Robert, who is originally from Weston-Super-Mare, studied geology as his first degree and worked as a cartographer before specialising in animation. This early focus on landscape has subsequently influenced his approach to film-making; he is interested in storytelling through landscape, rather than through conventional characterisation. 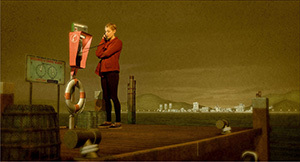 For example, he enjoyed using the dynamic coastal scenery in the film to reflect the characters' worries and uncertainties. Robert, who now lives in Stoke Newington, has worked as a lecturer at Middlesex University for four years. The live actor sequences in 'Dead Air' were filmed in the state-of-the-art 'green screen' studio at Middlesex. The film is showing at the BFI London Film Festival on Friday 17th and Saturday 18th October. Middlesex animation staff will also feature at the 2014 London International Animation Festival. Jonathan Hodgson, Programme Leader of Animation at Middlesex, will present a special event as part of the festival. He will be showcasing work by recent Middlesex graduates and discussing how his academic team of BAFTA-winning animation directors teach advanced animation film-making skills with an emphasis on experimentation, observation and innovation. Click here for further details.